As a cyclist, I make a very good runner. I don’t even like to use the word ‘cyclist’. I prefer ‘runner that rides a bit’. Then again, I’m forever telling people who run, who don’t like to call themselves ‘runners’, that ‘if you run, you’re a runner’. So by that logic I guess I am a cyclist! I haven’t been doing a lot of cycling lately. And by ‘not a lot’, I mean NONE. The bike has been in its traditional place, racked on the back of my couch, since it was last ridden on New Year’s Day. That day, I did 2 easy 10km rides in between the 2 New Year’s Day parkruns. Prior to this, my previous ‘proper’ ride was my first successful Norton Summit loop. So it was about time I dusted off the treadly again! During the week I’d made a few pretty big decisions. One was potentially career-defining (and not reversible) and the other one may yet be reversed! The first decision was to sign a deal to move from my government job (soon to be non-existent) to continue to do the same work in the non-government sector. That was an easy decision (a no-brainer) but still it was a bit weird to sign the form to resign from the public service after over 19 years! The second one was that I am not going to run a marathon this year. Or any time in the foreseeable future! I had always planned to go up to the Gold Coast where I’d run the fastest 2 of my 6 marathons, to get a sub 3:45 to qualify for Chicago, my second of the 6 majors. All summer, on Sundays I’d been enjoying whatever I decided to do (mostly trail running, occasionally cycling), all the while thinking about the impending start of the 16 week training programme, and the long road runs that invariably come with it! I did one long road run in January, in the week leading up to my 50k track race. It was 30k and it was horrible. In fairness though, I hadn’t exactly built up to it like you normally do. I’d just gone from zero to 30 and wondered why it wasn’t a great run! I thought to myself, it won’t be long before I’m doing this every week. And I wasn’t looking forward to it with eager anticipation! This Tuesday I wasn’t really enjoying my morning run. 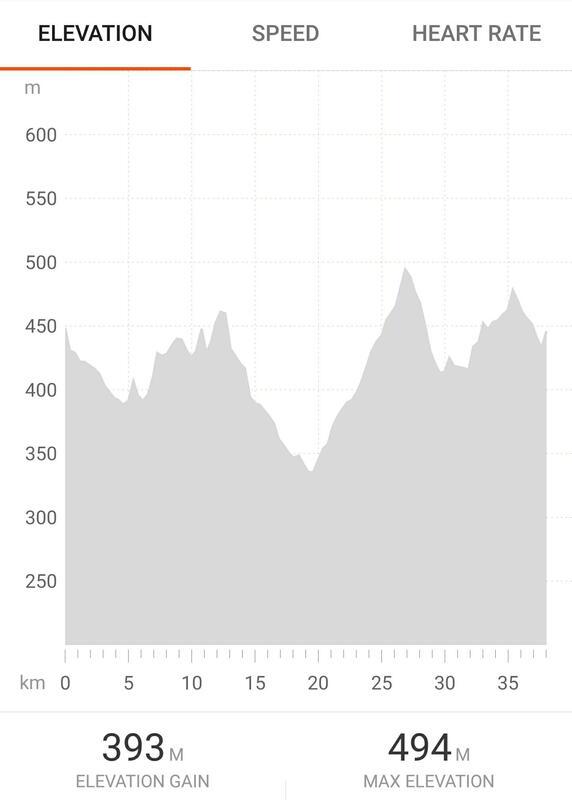 That may have had something to do with the fact that it was the hilliest of the normally flattish Tuesday run routes. And I’d just come off a pretty hilly trail race on Sunday, and had quite a bit of ‘vert’ in the legs for the month. Then I thought to myself, why am I doing this? I don’t want to do a marathon this year! Marathons are hard! Actually it’s more the training that I don’t want to do, and without the training I’m not going to get the time I want, and without the time I want it’s kind of pointless, so I guess that means I don’t want to do a marathon this year. So then I thought, WHY am I doing this? If I don’t want to do it, why am I doing it? And that was when I decided that I’m not going to do it. If I do decide to enter Chicago it will be either via lottery or a package. And just like that, I started enjoying the run a whole lot more! (Plus by this stage I’d finished the big climb and was running back downhill). With no marathon to train for I can continue doing trail runs on the weekends, and training properly for Five Peaks 58km and UTA 100km. I’ve done just over 5000m vert for the month of February, which is a lot for me. I think it’s helping. My hill running has improved a lot! The other thing I can do, now that I’m not training for a marathon, is get out and do a bike ride on Sundays instead of a long run. That’s what I did this weekend! The Grand Slam is a series of 5 group rides around some pretty spectacular and challenging parts of Adelaide and beyond. Today was the first of the series. Each ride has 2 options, the ‘Mini Slam’ and the ‘Grand Slam’ distance. The Mini is generally about half the distance of the Grand Slam. There is always the option of entering for the Grand Slam and ‘downgrading’ to the Mini – the course takes you back past the start line halfway, so you can refuel, top up your water, and then if you decide you’ve had enough you can pull out at that point. 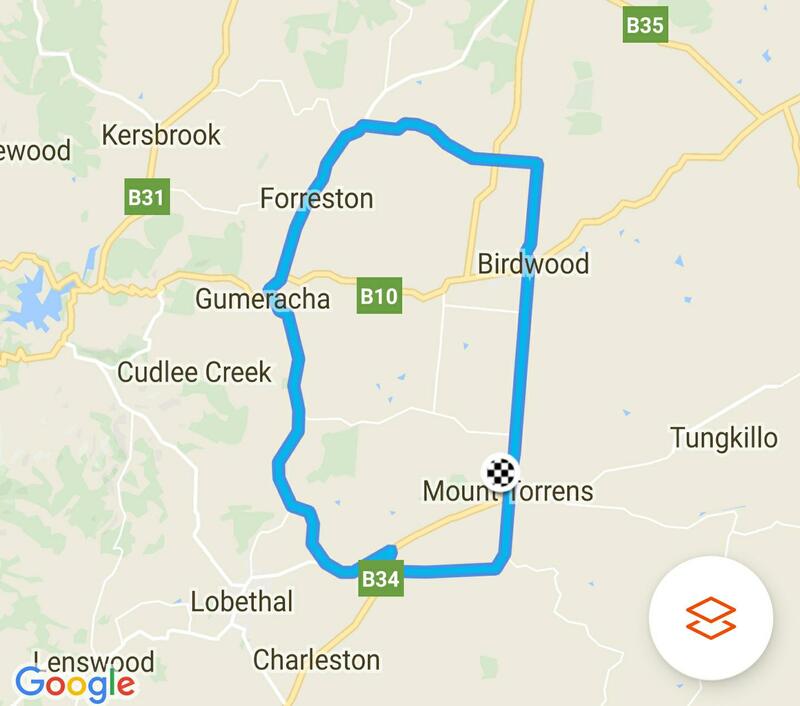 Today’s ride was centred on Mount Torrens, in the Adelaide Hills (up until this morning I had no clue where Mount Torrens was! ), taking in towns such as Gumeracha, Forreston and Birdwood. 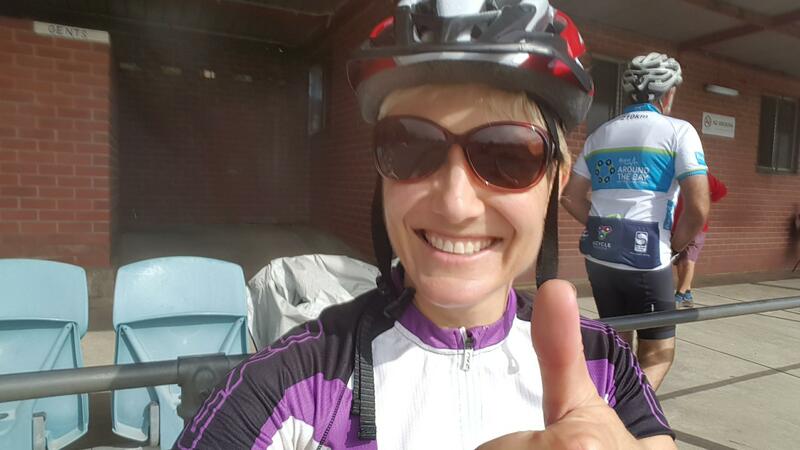 I decided to do the mini, given this was only my second group ride (after Gear Up Girl, a 55km relatively flat ride for women only) and my first involving hills. And I hadn’t ridden for nearly 2 months! The mini distance was 40km and the full distance was 80km. It was pretty cool at the start and there was even a bit of rain on the drive up to the start at Mount Torrens. 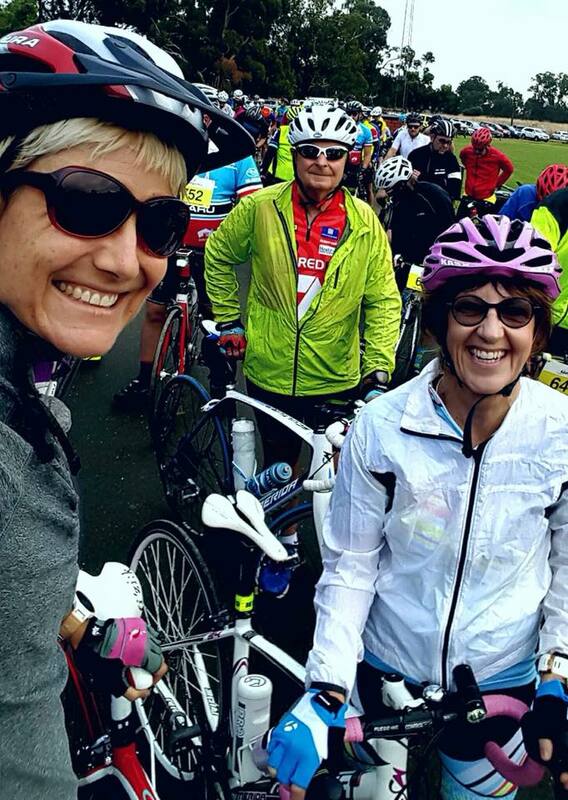 I was a little unprepared – I didn’t have any cycling arm warmers (and none of my running ones matched my cycling kit!) and for the life of me I couldn’t find my rain jacket! I did have a long sleeved running top which I threw in the car just in case. I ended up wearing it for the first half of the ride. The start was a wave start, with Karen, Daryl and me starting in the last wave. None of us were planning on setting a cracking pace, and were happy to let the fast ones have a clear run! Just in front of me was a guy in a T-shirt and shorts (ie not bike shorts! ), illustrating perfectly how inclusive these rides are. They cater to everyone from the elite to the complete newbie! As long as you have a bike and can ride it, you’re in! The obligatory start line selfie! It was a challenging course, and although partway through the loop I thought to myself that I might have been able to give 80km a crack, I was glad by the end that I hadn’t opted for the long distance! After all, my longest ever ride was the aforementioned 55km Gear Up Girl ride, which was a much easier ride than this one, and other than that I hadn’t done anything over 30km! At first I was RIGHT at the back, and trying to keep Daryl in sight, but as my legs got warmed up and I got used to being on the bike again, I gradually caught up and passed him. The ride was quite hilly but manageable. Karen had previously told me that some people stopped and walked their bikes up some of the hills! I was expecting that I would be doing the same at some point but I didn’t want to be the first, I was hoping that I’d see someone ahead of me hopping off their bike and then I’d feel like I could do the same! I was pleased to pass the guy in the T-shirt. Although I’m not competitive when it comes to cycling, I did draw the line at a guy in a T-shirt and shorts being faster than me! I did most of the ride on my own, except when I was overtaken by some of the faster late starters, or overtaking some other runners. It was actually really nice, and being not particularly busy roads, I felt quite safe even on the 100km/h roads with hardly any shoulder! I even managed to get a bit of speed up (and I’m not talking anything particularly rapid here) on some of the descents. Some of the roads were very smooth, and I could ‘fly’ down them without even contemplating using the brakes! My previous hilly ride, Norton Summit, was on a day when the roads were covered in debris from a recent storm, so I was quite cautious on the downhills. One stick could result in disaster! Today though, the roads were nicely clear for us! Of course, getting some speed up on the downs helped to get some momentum to get me up the hills too! There was a refreshment stop at about the halfway mark. Unlike in running events, where most people either don’t stop at all, or only stop for long enough to grab what they need and keep going, in these events people tend to stop for a decent length of time. You get off your bike and have a decent rest. This was the first (and only) time I ran into Karen, she being quite a long way ahead of me, and when I arrived at the checkpoint she was bonding with one of the volunteers’ dogs! Karen was doing the full distance (Daryl, like me, was going for the short option) and she set off not long after I got there, saying she’d see me back at the start, where she’d stop for refreshments before heading out on the second loop. Daryl, who had ridden this course before, kindly told me that the second half was harder than the first! Apparently there was a particularly nasty hill around the 30km mark. I decided at that point not to look at my watch until I was finished. It would come as a ‘nice’ surprise! I commented to Daryl that as we approached each of the towns, where the speed limit dropped to 50km/h, I would instinctively slow down (like I would if I was driving)! AS IF I was doing more than 50km/h! The second half was a bit hillier, but I hadn’t encountered anything particularly brutal. Then I came to a point where I had to make a right turn, and I heard another cyclist coming up behind me. I was going to let him pass me but he was happy to sit behind me. That was when he asked me if I was intentionally riding up hills in the hardest gear. (Apparently some people actually do do that!) Of course, I was not! I had thought I was in the easiest gear and I was just a bit unfit! He kindly gave me a few pointers to get myself into the right gear, and after that (surprise surprise) it got a whole lot easier! I hadn’t ridden since New Year’s Day, and on that day one of my friends had set the bike up for me on the right cog so I wouldn’t have to change cogs during that particular ride. I had mistakenly assumed he’d set me up on the easiest cog, but no, it was the hardest one! I managed to climb all the hills (helped by a few nice descents in between) until I hit a particularly steep climb at the 35km mark. I got to the point where I couldn’t ride in a straight line, I couldn’t get the pedals around smoothly and I was riding all over the road. So I decided the only option was to get off and walk. At the same time a girl in front of me was doing exactly the same thing! I managed to get my left foot uncleated before coming to a stop, but couldn’t quite manage to get off the bike while still remaining vertical. I did a very graceful stack to the left, with quite a soft landing and no damage done! It was only a really short climb so probably 50 metres max of walking before the grade levelled out and I got back on the bike again to finish the ride. I got to the start of Mt Torrens town, back in familiar territory, back on the road I’d driven earlier in the morning. I realised at that point that it wasn’t 40km but actually only 38km. That was plenty! I put myself back onto one of the harder cogs as by now I was back on the flat. After finishing I went inside to check in and grab a quick bite to eat before going back outside to wait for Daryl. We then got in his car and went to follow the route of the second lap, to catch up with Karen and take her some sustenance! Driving along the second lap route we were both glad we’d opted for the short course! I was really glad to have gone out and done this today. I was pleased to have managed most of the ride without having to get off (despite being in totally the wrong gear for most of it – clearly I have much to learn!) and it was a beautiful course with some stunning scenery! 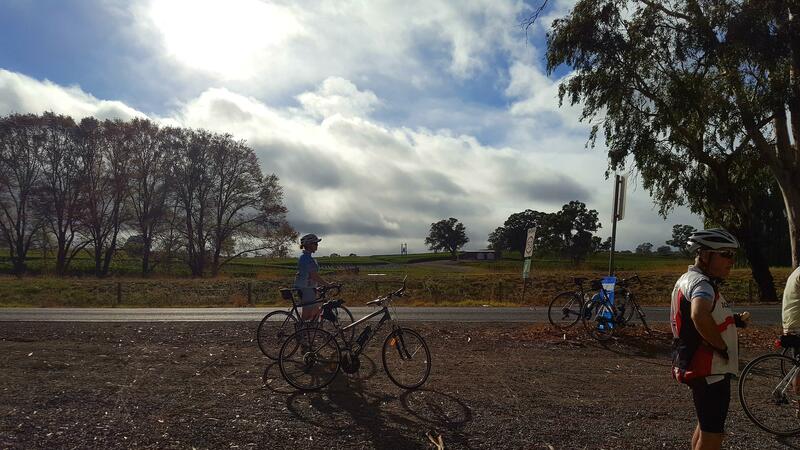 We rode past quite a lot of vineyards – the Adelaide Hills being a well known wine region – but fortunately no cellar doors, otherwise I may not have made it back to the finish! We did get a tiny bit of rain, and I’d never ridden in rain before so I’m very grateful that not much came of it! I’d like to thank Bicycle SA for putting on this event, which is, as I said earlier, really for anyone! The volunteers were fantastic, and the course was so well marked that even I could follow it! (Hot tip: when doing one of these rides, always follow the arrows rather than other cyclists – not all cyclists are actually part of the event, and who knows where you might end up!) 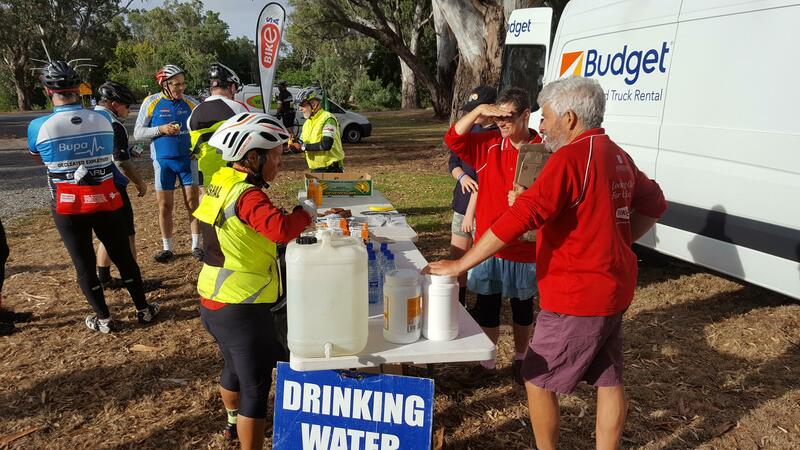 The refreshment station was well positioned and very much appreciated! Some of the fantastic volunteers at the refreshment stop! See, it’s not that bad! I’m hoping to get out and do a few more of them throughout the year but unfortunately the next one is the day after the 58km Five Peaks Ultra. Yeah, I don’t think that’s going to happen!